TOKYO (Bloomberg) -- Toyota Motor Corp. will recall Lexus cars sold in Japan and in China after saying engines in as many as 270,000 vehicles worldwide may have a defect that can lead to stalling. The company will recall 91,903 Lexus GS 350, GS 450h, GS 460, IS 350, LS 460, LS 600h and LS 600hL models and some Toyota Crown cars in Japan because of problems with valves that may cause the engine to stall, according to a statement on the Web site of Japan's Transportation Ministry today. Toyota is working to restore its reputation for quality after recalling about 8 million vehicles globally for defects linked to unintended acceleration. The company recalled about 13,000 Lexus GX 460 sport-utility vehicles in April after Consumer Reports labeled the model a “safety risk” because it could roll over. The designation was removed in May. The recall in Japan covers cars built between July 2005 and August 2008. The automaker will notify U.S. regulators of the recall next week, Toyota said on July 2. About 138,000 vehicles in the U.S. may have engine problems that may include stalling while the vehicle is moving, according to the company. 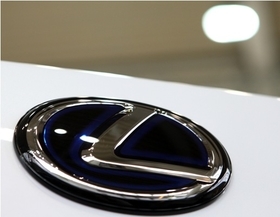 In China, the company will recall 5,791 LS 460, LS 460L, and LS 600hL imported models from July 17, according to a statement on China's General Administration of Quality Supervision, Inspection and Quarantine's website. The latest recall may cost the carmaker 20 billion yen ($228 million), the Asahi newspaper reported last week. Toyota spokeswoman Ririko Takeuchi declined to comment on the potential cost. The engine problem may result from “contaminated materials used in valve springs,” Mark Templin, U.S. group vice president and general manager of the Lexus brand, said July 1 on a conference call. Toyota, which paid a record U.S. fine of $16.4 million this year for not complying with auto-safety regulations, said on June 25 it would recall the Lexus HS 250h sedan after too much gasoline spilled in U.S. government crash tests, posing a fire risk.